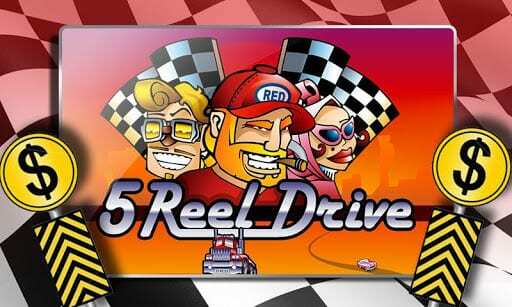 Here's an automotive-themed 5 reel slot game from the team at Microgaming, with a real 50's feel and some superb gameplay features transport yourself to the 1950s racetrack scene. Speed your way onto that chased chequered flag and beat your opponents to achieve some great free spins and cash rewards. Get started and play slots online at this link! Founded in 1994, Microgaming was the first online casino of its kind. Starting at the top of the food chain, Microgaming has maintained its position at the top of the industry through its monthly updated portfolio. Now with over 850 games, with 1200 variations, and many spin to win slots games, this developer is sure to have something for everyone. Despite their large collection causing a stream of success, Microgaming reserve their pride for the quality of their creativity rather than the number of titles created. This 5-reel adrenaline driven machine is filled to the brim with fast cars and even faster food. It's best to find out more best slots before you decide on playing one. Perfect for that open road mindset, 5 Reel Drive is a back to basics machine, removing any unnecessary features to create a clean and easy to play experience. Before taking to the tarmac, players should put the pedal to the metal and set their initial wager. At the bottom of the reel gamers will find the options to set a coin size as well as the number of coins spent per spin. Like with all casino games the greater the risk, the greater the reward so spending more money per spin will return a much greater profit. Once the bet is set, all that’s left to do is click spin – when 2 to 5 higher paid symbols or 3 to 5 mid-range symbols match in an active payline gamers can expect a much-welcomed cash prize. 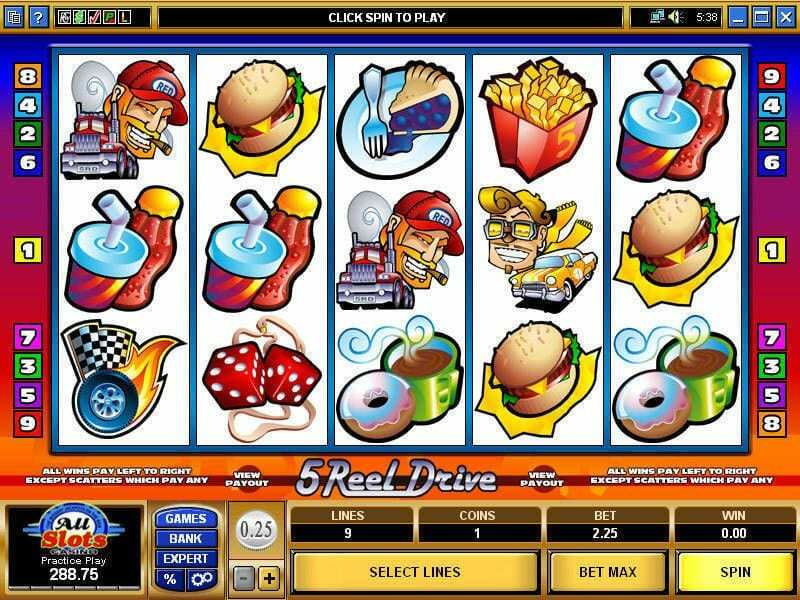 Taking on a cartoon aesthetic, this 9-payline game showcases a range of symbols based on the great American highway. The 12 in-game symbols include imagery from 2 main sectors, on-road vehicles and off-road pit stops. The fast-food symbols will grant players the lowest rewards but are the easiest to match, these include coffee and doughnuts, blueberry pie, soda, fries and cheese filled burger or two. For symbols of higher worth, aim for the fuzzy dice, pink car, yellow car, trucker and flaming wheels. With a grand jackpot of 10,000 coins for 5 matched wheels, you will be driving straight to the bank. Creating the Wildest drive of your life are the swerving road signs. When appearing within a reel this symbol can act as a replacement for any other none bonus symbols to enable a winning combination for players. Driving reckless will also attract the attention of the local police, but unlike in real life, players want to attract these Scatter symbols. Not needing to be found in a single payline, finding 3 anywhere throughout will award players x5 their total bet, 4 will give 20x and the ultimate prize of 5 Scatters will multiply their initial wager by a 50x multiplier. Following the American dream, 5 Reel Drive showcases two of the country’s biggest money makers – fast cars and fast food. Unlike many slot machines, this instalment by Microgaming is a no-nonsense machine, removing any unnecessary additions and allowing players to enjoy the game without complexity. Each bonus round is easily achieved and has the potential for huge payouts, this game may not have as epic a storyline as other instalments by Microgaming but it allows players to experience the digital landscape of online casinos in all its glory.